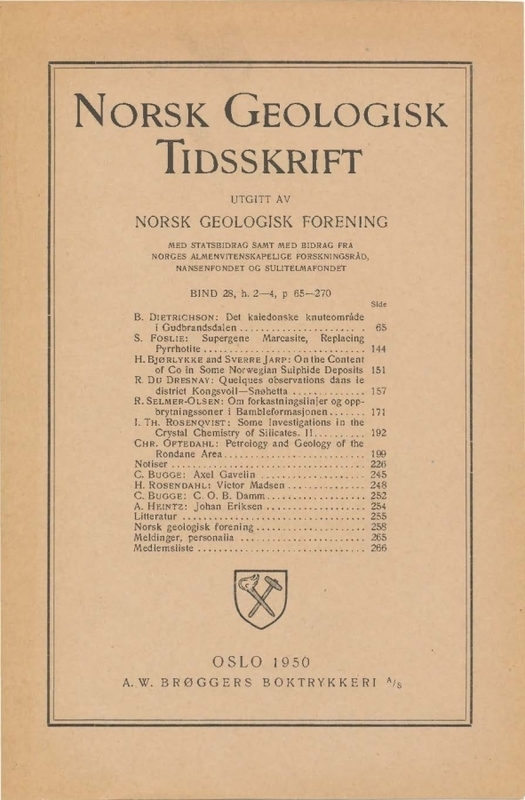 Petrology and geology of the Rondane area. The monotonous spamgmites (arkosic sandstones) of the Rondane mountain group are described petrographically and tectonically. The sparagmites are of Eo-Cambrian age and have been deformed by overthrust movements during the Caledonian orogeny. Quartz and feldspar have partly recrystallized. Microcline is characteristically poor in soda, showing a composition similar to that of adularia, thus indicating a very low-temperature regional metamorphism. The sparagmites show marked lineation on the schistosity planes, and ail quartz conglomerates are deformed in one direction. Linear structures and iold axes both coincide with the direction of tectonic transport.